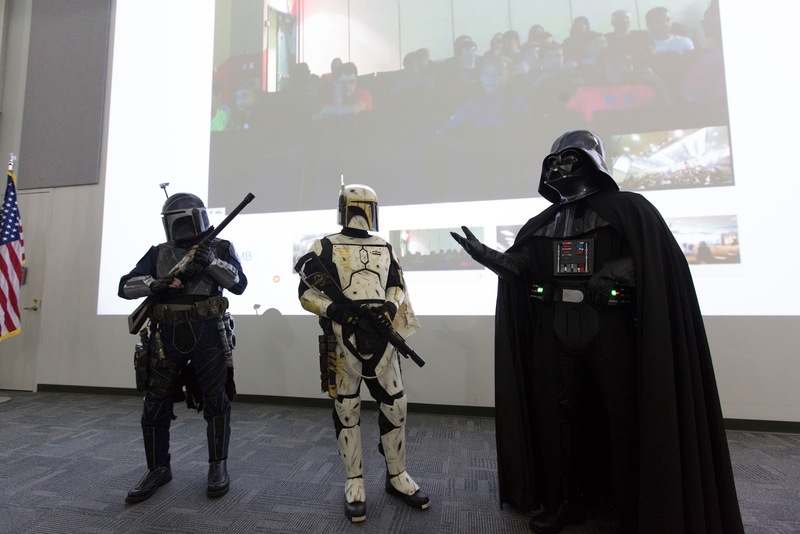 Darth Vader and other Star Wars characters from the 501st Legion address students and sponsors in the Center for Space Education at NASA’s Kennedy Space Center in Florida. Teams from across the state of Florida were gathered at Kennedy for the finals of the Zero Robotics Middle School Summer Program national championship. The five-week program allows rising sixth- through ninth-graders to write programs for small satellites called SPHERES (Synchronized, Position, Hold, Engage, Reorient, Experimental Satellites). Finalists saw their code tested aboard the International Space Station. 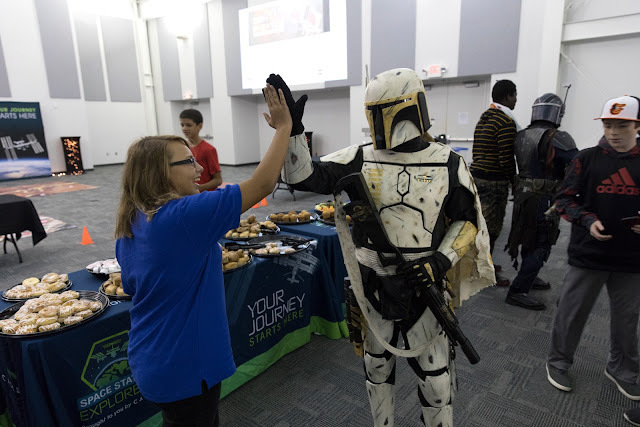 A middle-school student high-fives a Star Wars character from the 501st Legion in the Center for Space Education at NASA’s Kennedy Space Center in Florida. Teams from across the state of Florida were gathered at Kennedy for the finals of the Zero Robotics Middle School Summer Program national championship. The five-week program allows rising sixth- through ninth-graders to write programs for small satellites called SPHERES (Synchronized, Position, Hold, Engage, Reorient, Experimental Satellites). Finalists saw their code tested aboard the International Space Station.